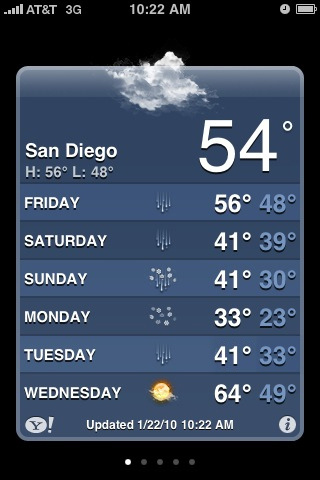 Some weeks it seems like we don’t have nearly enough! Your high schooler may feel the same way, and when they’re stressed about upcoming tests and losing track of assignments in their messy backpacks, their grades can suffer. Introduce these 7 time management techniques to your teen to get organized and on track for school (and maybe steal a few for yourself!). Even as full-grown adults, the majority of us can’t answer these questions with bullet-points, but we should be able to! This is the idea behind SMART goal development, goals that are Specific, Measurable, Actionable, Realistic and Time-based. Take some time every Sunday to sit down with your child and discuss the upcoming week. Then have them write out Monday – Friday and note the amount of hours they have for each. There should be a start and end time for every day. Help them place the different tasks based on priority and time. Click here to check out a helpful video from Prepped and Polished. If I offered you $500 to correctly guess what your child was doing at this very moment, “checking their phone” is probably your best bet. In today’s world, kids are practically glued to their phones, but this dependency can be used to their advantage. Calendar updates are great for everyone. I have them, you have them, and your child can use them to stay on track for school. 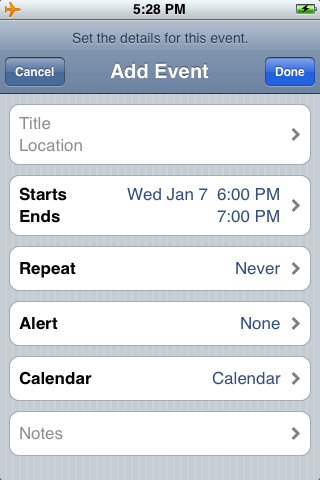 If your child never uses their calendar, help them find it on their device and show them how to set up alerts. They should make a habit of adding assignments and upcoming exams into their calendar from their planner every night. But, I get it. Telling your child to update their calendar every night doesn’t MEAN they’ll actually do it. 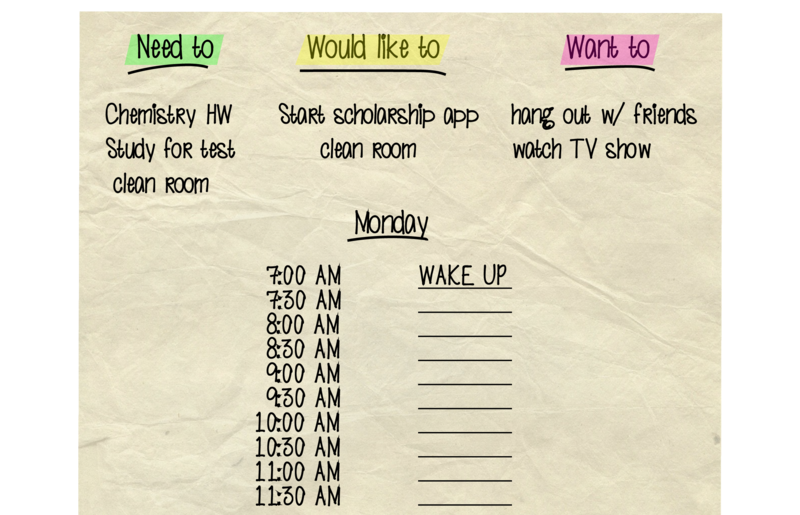 If you can’t get them in the habit, here’s an alternative — introduce your child to one of the many helpful high school planner apps! When we have a large, time-consuming task to complete, we tend to put it off because we don’t really know where to start and feel overwhelmed. When your bathroom looks like a war-zone it may drive you crazy to look at, but you’re running late for work so you just close the door… then when you get home from work, you’re tired and you want to relax so you say you’ll do it tomorrow. “Cleaning the bathroom” can seem like a simple task, but what does it really entail? No wonder you can’t get around to “simply” cleaning the bathroom, because it’s not simple! You have to break it into smaller, less-intimidating tasks and then check them off one by one. Show your child how to do this. Have them write the big task at the top, and then break it down into littler tasks. Turn these smaller tasks into a checklist that they can follow. Ever stay up at night going over the things you have to do the next day? 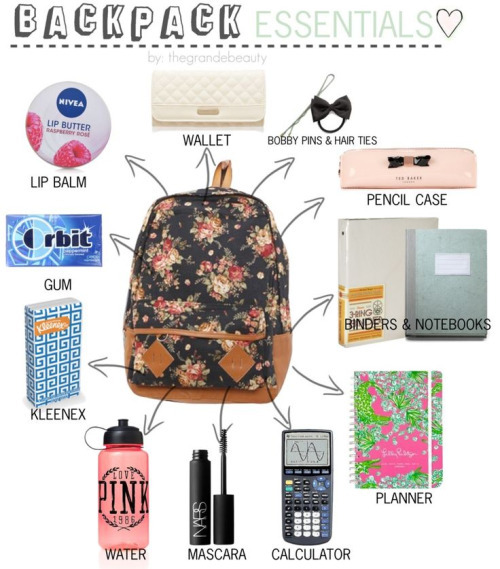 Your teen may be losing sleep trying to keep track of everything they’ll need for school the next day. They may be skipping breakfast or not packing a lunch because they don’t have enough time in the mornings. 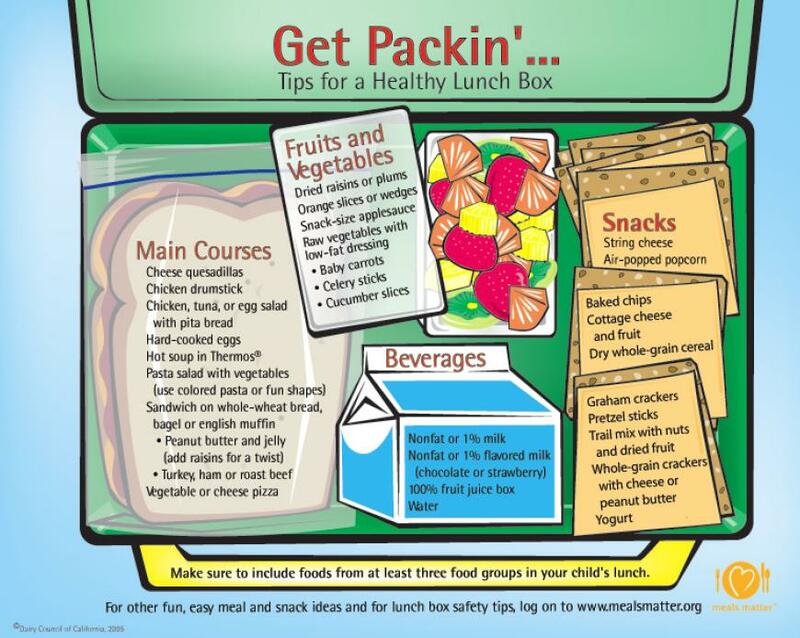 Help your child get into the habit of packing their lunch the night before school and show them which foods make a healthy lunch so they get the proper nutrition to enhance their academic performance. Remind them to put everything they need to take with them in one pile so they don’t have to check again in the morning. It may sound silly, but for students who don’t wear uniforms, deciding on something to wear the morning of school can be a time-sucker. A great life hack for this is to check the weather report for the following day so they can get a better idea of how they should dress. Have you seen your kid’s backpack lately? What about their room? Teens can be messy and disorganized. They’re not quite at the stage in their life where they understand the importance of keeping things in order, but this doesn’t mean it won’t significantly improve their day-to-day activities if they can learn! 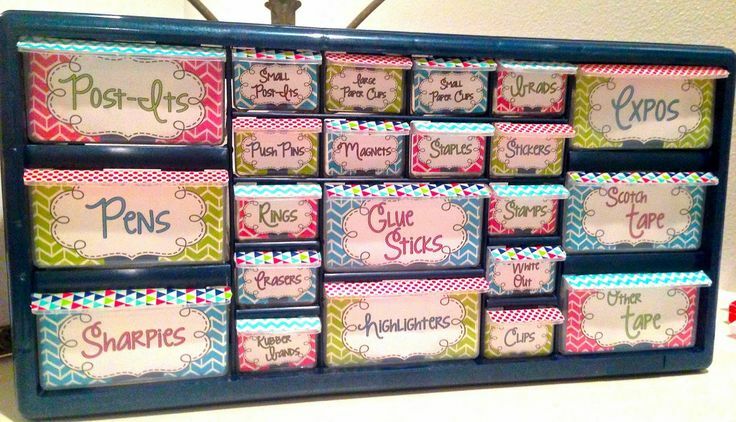 This “Teacher Toolbox” by Create Teach Share is a great example, but you don’t have to stop at school supplies. To time themselves, your student has quite a few options. 30/30 is one high school app students can use. The Pomodoro method is another optional time management technique. Here at Student-Tutor, our entire team uses Toggl to develop better time management skills. How will time-tracking help my student? If you’re after meaningful hours, you have to rethink the relationship between work and time. That relationship is fluid. Encourage your child to pick a time-tracking method that suits them and stick to it. When they get a sense for how long things REALLY take versus how long they THINK they take, they’ll increase their overall productivity and utilize their newly instated time management skills towards existing projects. Imagine you’re doing your taxes online. You’re a quarter of the way done when your screen goes black. You tap the mouse but it doesn’t come back on and… your computer is dead. Maaaybe some of it is auto-saved, but what about the rest of the work you just did? Our beloved technology is not as secure as we may think. USB’s, for example. You may not realize that a USB is predetermined to self-destruct at any given point in it’s existence, with no warning at all. Phones and computers die. Your student can lose a 5-page research paper if they don’t have it saved at an inopportune time of reckoning. Introduce your student to Google Docs so they will never lose another assignment. If you’re new to Google Docs, it comes with Gmail, and saves your work in real-time. When your kid’s computer dies on them, they can hop right on a separate computer or plug their’s into a charger and pick up right where they left off! Use an app like Toggl to track your time! Toggl focuses on making time tracking easy, so all you have to do is click the “start” button and you can start tracking your time for any project, and “stop” when you’re done. It really is as simple as that. After a month see where you have spent your time and what areas can be improved! You may be amazed on what areas you can improve in. If you want an in-depth review of this app, make sure to check out Time Doctor’s review by clicking here! Staying organized and on track is something a lot of teens struggle with, but if they can make a habit out of these 7 time management techniques, they will feel more confident, less stressed, and perform better in their academics overall. As a parent, helping guide your student in the right direction towards cultivating better time management skills will ultimately pay off. Once they get the hang of things, they will be able to see and experience the benefits for themselves, and you won’t have to keep reminding them! Do you or your student use any time management techniques or time management tools that I didn’t list above? Tell us about them in the comments below! Do your tutors tutor time management, organization of tasks, accountability and study skills in addition to school academics?